You are here: Home / Healthy Dog Diet for Bichon Frises / Your Bichon Frise Dog Ate Chocolate – What Should You Do? 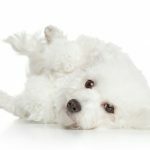 Your Bichon Frise Dog Ate Chocolate – What Should You Do? Suppose your Bichon dog ate chocolate. Of course you have heard that chocolate can be deadly to dogs. You may be panic stricken. But, if your dog eats chocolate, there are a few things that will determine whether he has an upset tummy or an emergency trip to the vet. If you are a chocolate lover, you will understand the attraction that your dog has to chocolate. 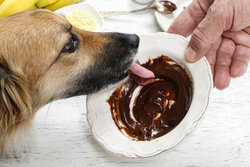 Dogs are attracted to chocolate just like we are, and they find it as tempting as a big juicy steak. In fact, dogs have been known to rip apart the wrapping on a box of chocolates under the Christmas tree. Or help themselves to chocolates in a candy dish or treats in a bag on Halloween. Bichons have even been known to catch a piece of chocolate as it falls to the floor. Because of this, it is important that you don’t leave chocolate lying around your home. Even the best behaved dog will become a sneaky thief if you are away or step out of the room. 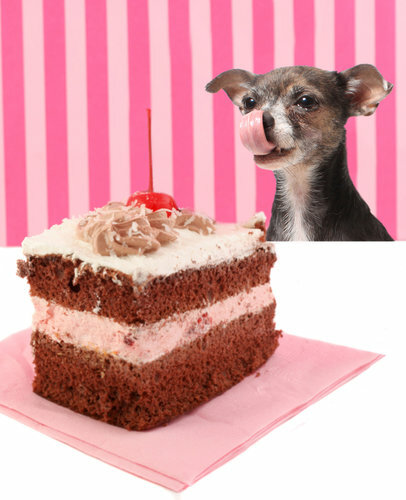 This little Chihuahua dog, licking his lips for a piece of chocolate cake, is a typical dog, with a love for chocolate. Chocolate is just too irresistible to your dog. And, while they love it, ingesting chocolate can also be fatal to a dog. Which chocolate is most toxic to dogs? With chocolate and dogs, size counts. Both the size of your dog and the amount of chocolate that your dog eats, determine how sick your dog can get. Unfortunately, Bichon Frises are small dogs and that means that, even if they eat only a little chocolate, it could make them critically ill. The reason that chocolate is bad for dogs, is that it contains two ingredients that affect a dog’s heart and nervous system. These ingredients, caffeine and theobromine, are stimulants that raise a dog’s heart rate, sometimes to the point of being fatal. But, all chocolates are not equal. Fortunately, when a dog eats chocolate, it is not always an emergency. In most cases, it just means an upset stomach and perhaps a bout of vomiting and diarrhea for a day or so. However, there are different types of chocolate, and each kind has varying amounts of caffeine and theobromine in it. And, since dogs will generally eat anything, chocolate does remain a concern. Cocoa bean hulls – Hershey’s in Hershey, Pennsylvania, offers cocoa bean mulch for landscaping that smells delicious, to both people and their dogs. It is highly toxic to dogs and should not be used for landscaping where dogs will have access to it. Milk chocolate – When milk and other ingredients are added to chocolate, the theobromine and caffeine are diluted, making them less harmful. White chocolate – has very little theobromine and caffeine. Bichon Frises are small dogs, and they can’t eat very much chocolate without getting sick. And, dogs being the little piggies that they are, will consume any chocolate that is in sight (or smell), and that can be way too much! The amount of chocolate that can kill a dog varies with the dog’s size and the kind of chocolate. For example, one ounce of milk chocolate per pound of body weight is a potentially fatal dose. A 15 pound Bichon would have to eat about 15 ounces, or just about a pound of milk chocolate for it to be fatal. On the other hand, pure dark chocolate like baking chocolate, takes only 1/10 ounce of chocolate for every pound the dog weighs. In this case, a 15 pound Bichon Frise would only have to eat 1.5 ounces of baking chocolate for it to be fatal. Giving your dog any amount of chocolate is a bad habit to have. A bar of Baker’s baking chocolate is 4 ounces, so if you dropped just one (one ounce) square and your dog caught it, he is getting close to a critical dosage. In addition to the weight of your dog and the kind of chocolate he ate, there are two additional risk factors to consider. Age and health. Older dogs, puppies and weak dogs that have a heart condition are especially vulnerable, so you should call your vet right away if your dog is old or ill already and eats chocolate. Often if your dog ate chocolate, you’ll know because you’ll find the empty candy bar wrapper or container, missing the chocolate. That’s your first clue. If you suspect that your dog ate chocolate, then you should be alert to the symptoms of chocolate poisoning in dogs. Usually you will see symptoms within 6-12 hours after your dog ate the chocolate. Thirsty – Your dog will become excessively thirsty. 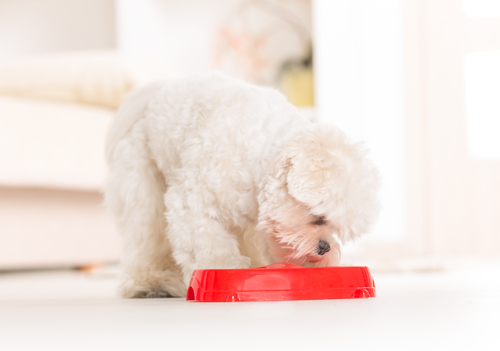 Vomiting – This is often how your dog’s body gets rid of harmful things that your dog has eaten. Lack of coordination – he may have trouble walking, getting up or he may stumble. Excessive urine – He may pee large amounts of urine. Your dog’s body may be trying to rid itself of the toxins. High blood pressure – your vet will determine this. If your dog is showing any of these more serious signs after ingesting chocolate, she needs to see the vet immediately, as it is an emergency. There are some things that you can do if you suspect your dog ate chocolate, and you think it was only a small amount. Or, if you know your dog ate chocolate, you could try these things right away, while someone calls the vet. If your dog is already vomiting, you don’t need to induce vomiting. But if she isn’t vomiting, you can try to get the chocolate out of her system quickly by vomiting. This is especially effective if done within 2 hours of eating chocolate. After that, the chocolate will be well into her digestive system, and it will be too late to do this. You should probably call your vet before inducing vomiting, even if you know when your dog got the chocolate and how much he has eaten. You will need 1 ml. of 3% hydrogen peroxide for every pound your dog weighs. A teaspoon is 5 ml., so for a 15 lb. Bichon, you would need 3 teaspoons, which is the same as 1 tablespoon. Squirt the hydrogen peroxide into the back of your dog’s mouth. You can use a syringe or even a turkey baster to do this. Wait 15 minutes. If your dog has not vomited, repeat the process. Do not do this more than 2 times. If your dog has not vomited after 2 doses, call your vet. You can’t afford to waste time trying to get her to vomit. Activated charcoal is an old-time remedy for poisoning that has been used for centuries. But, it has not been forgotten. Veterinarians often use it with animals for accidental poisonings. The charcoal is made of very fine particles that work by attracting the toxins and then moving them out of your dog’s system quickly. Your dog’s feces may be black for a day or two. This is perfectly normal, and it is caused by the dark color of the charcoal. Activated charcoal is perfectly safe to give your dog. 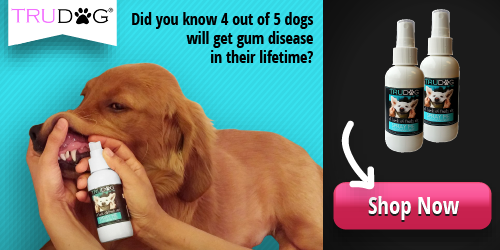 It is used routinely by veterinarians and by hospitals like the Mayo Clinic with patients who have ingested toxins. Keep some activated charcoal on hand for emergencies. But do make sure that you use the food grade activated charcoal, as the kind used in swimming pools is not safe for consumption. I like to make dog treats for Skipper with activated charcoal. I keep some on hand for those occasions when she eats something nasty and I want her to get it out of her system quickly. You can find my charcoal dog treat recipe here. If your dog does not respond to conservative treatment, do not hesitate to call your vet or poison control center. Your vet will decide on treatment, based on how much chocolate your dog ate, how long ago it was and how much your dog weighs. Fluids – to increase urine output and to speed up moving the theobromine through your dog’s body. Even after starting treatment, your dog may still have symptoms for up to 72 hours. Of course both you and your dog love chocolate. I certainly do. And, even though chocolate is harmful to dogs, you can give your dog a treat that tastes and smells almost like chocolate. Carob is a healthy chocolate substitute. It has a natural sweetness and contains very little fat, no caffeine, and carob encourages the absorption of calcium. Used in Europe for young farm animals, it prevents stress-related diarrhea. It has also been used to inactivate e-coli bacteria and to promote healthy intestinal bacteria in animals. So, how can you give your dog healthy carob so that she can enjoy the pleasure of “chocolate” with you? Make your own dog treats with carob – Use carob powder in your homemade dog treats. Use a dog carob cookie mix – You can bake dog cookies with a dog cookie mix like this one. Ready-made carob dog treats – Of course you don’t have to bake your dog’s treats. You can buy creative and delicious treats already made. You’ll find everything from chocolate chip dog cookies, coconut carob dog bones, to gourmet carob wafers. You don’t have to give up having fun with your dog, but you also don’t have to share your chocolate. Consider giving your dog a treat with carob, a great chocolate substitute, so she can eat a treat while you eat yours. The best way to keep your dog safe is to keep chocolate out of reach. Even if you are baking, do not leave chocolate on the counter unattended while you answer the door or phone. And, in addition, teach your dog the “drop it” or “leave it” command, so if you catch her in the act of stealing a chocolate bar, you can get her to drop it.